Everything you need is included in English for Everyone: Level 2: Beginner, Course Book—it's a grammar book, vocabulary builder, and exercise course all in one. Learn to engage in everyday topics such as clothing, the weather, making plans, and more. 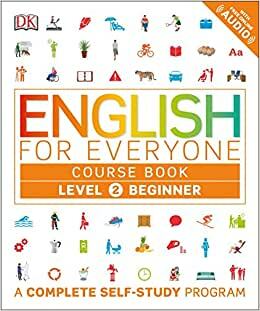 English for Everyone: Level 2: Beginner, Course Book also covers how to talk about the past, present, and future and is the perfect choice for people with some basic knowledge of English to expand their skills over a wider range of everyday words and situations. Got this for my wife. Fantastic book for ESL, I like their method. They have free recording, British accent though. I like it. My students do not. Great book to learn English by yourself! Very helpful and easy to use! Bought onw for me and for my mom. these books were so great we ordered more for our ESOL program.